As most of you know, I am a vintage trials fan, I enjoy the riding, setting up sections and working the event (checking). One day when we were pre-riding sections at Roger’s house, Johnny B started telling me about his SWM 320 and how much he loved the bike. That set the hook! 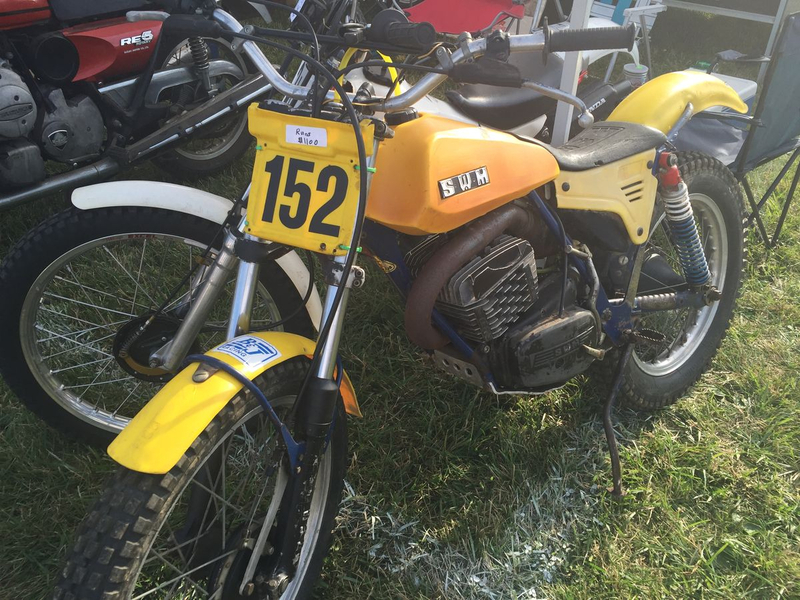 Later that year, while visiting Mid-Ohio Vintage Days and cruising the swap meet, there it was! I looked around to see who the seller was and I saw my friend, Mike Harrington – another trials enthusiast. Turns out he was selling it for Stan Bollinger, who only lives about a half-hour away from me in Maryland! The bike ran but needed a complete overhaul – I was very attracted to the blue frame and yellow body work. I did the restoration with help from Rob Meadows on the Rotax engine with the intention of riding it… But you know, sometimes they just come out too good! I have puttered around the trials section a couple different times, but it may just be retired to a display model. Neat machine!